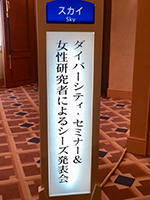 On Friday 5th of October, the "Diversity Seminar & Female Researcher Lecture Series" was held in the Sky Room on the 13th floor of Nakano Sun Plaza (Nakano City, Tokyo). This event aimed to promote women's research activities and to present the results of research conducted by female researchers to businesses, with the overall goal of creating sustainable innovations through industry-academic collaboration. For this seminar, a presentation was given by the Soken Medical Corporation Managing Director, Ms. Hiromi Ishiwatari, on "The 18-Person Company that Changed the World of Top Athletes: Work Ethic & the Merits of Industry-Academic Collaboration". 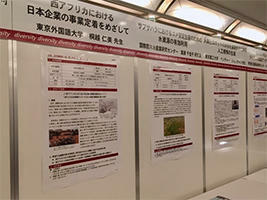 For this lecture series, seven presentations were given by various speakers including Tokyo University of Foreign Studies Specially-Appointed Researcher Hitomi Kirikoshi, who presented on "The Historical Commercial Network of West Africa and its Modern Distribution System". Other presenters and titles are as follows. 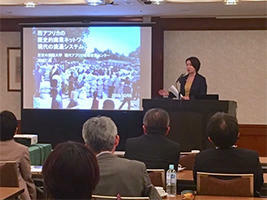 Tokyo University of Agriculture and Technology, Associate Professor Gentiane Venture x Surf Clean Ltd.
"Present State and Trends in China's Silver Industry"
As part of the 2016 Ministry of Education, Culture, Sports, and Technology (MEXT) Funds for the Development of Human Resources in Science and Technology Project, 'Initiative for Realizing Diversity in the Research Environment,' TUFS was selected to work alongside the leading institution of this project, Tokyo University of Agriculture and Technology, and is currently working towards creating a more comfortable environment for female researchers to work in.